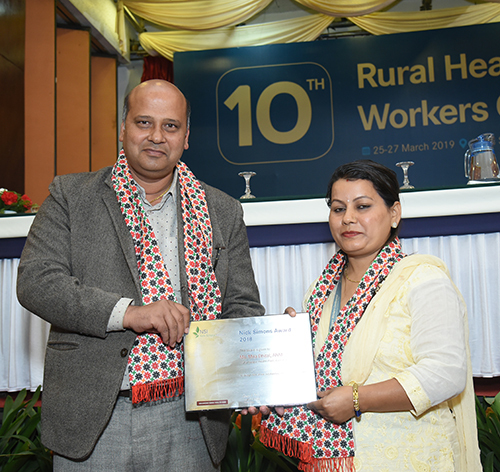 Each year, NSI in collaboration with National Health Training Center (NHTC) identify and select one rural healthcare worker for his or her excellent service to rural healthcare of Nepal. NSI and the government work from a long list of nominees, first conducting phone interviews with community officials, and later visiting the institutions where finalists are working. The award is given with the recognition that it is symbolic: many others labor in a similar, heroic manner all across Nepal. The award comes with a cash prize and a token of love. Hon. State Minister of Health Dr. Surendra Prasad Yadav giving Nick Simons Award 2018 to ANM Ms. Mira Dhital, Mahamadpur Health Post, Rautahat.